Hooray! This weekend I finally got the lamp I've been wanting for so long. 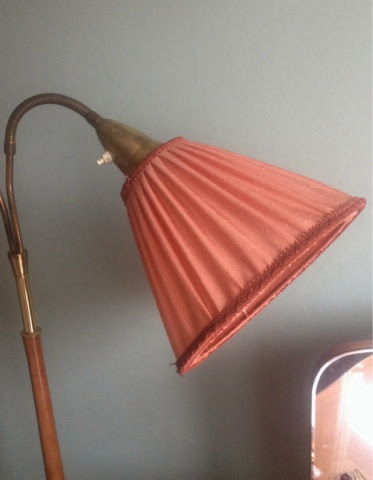 It's been really hard to find those 2-3 armed 1940's lamps, and if you do manage to find one listed for sale online, they've usually already been sold. With the help of my boyfriend I found a beautiful lamp that actually was still for sale! 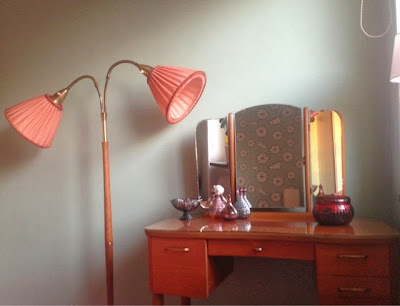 The teak wood body and brass details match nicely with my 50's makeup table and the peachy lampshades look great against the minty bedroom wall. It will be so nice to have a little extra light when I'm sitting at my makeup table in the morning! Some details. 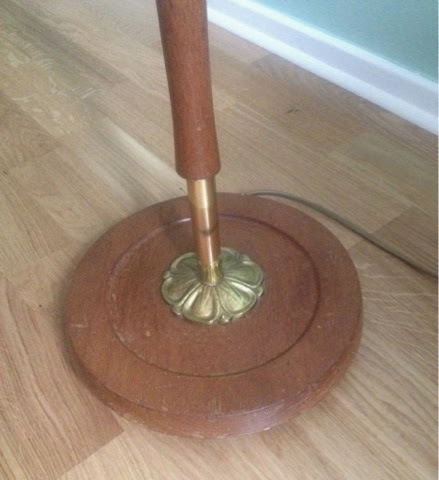 How cute is the flower on the base of the lamp?! So Friday night my boyfriend and I drove out to the seller and bought the lamp. After we brought the lamp home we went out and had a nice dinner. It's always great to have a casual date night! Saturday was pretty luxurious, too. It was a day filled with shopping and an evening of delicious homemade pizza and fun with friends. Such a long day calls for a super comfortable dress, so I wore one of my "new" old dresses: a 1950's day dress from JCPenney that I bought from DustyLuck on Etsy. 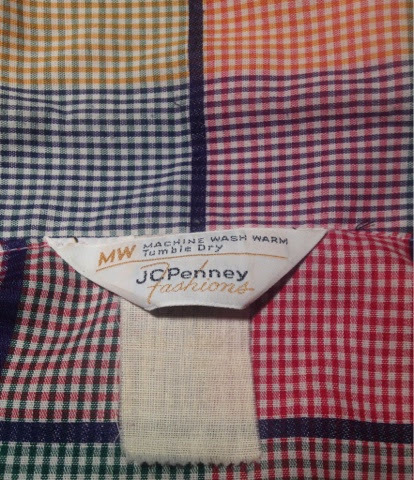 There's the JCPenney tag along with a close up of the fabric. The plaid! I am such a sucker for plaid. And I love the color combinations! A shopkeeper told me yesterday that I looked very springy in those colors, which was nice to hear. Well, I'll do anything I can to help spring hurry along! 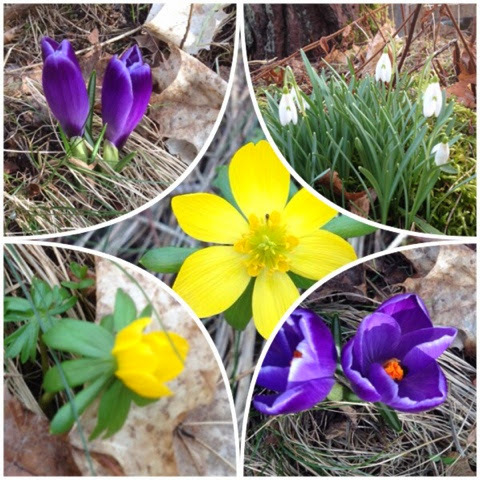 When I was out in the country the other week I got to see the very first flowers of spring opening up: blue crocuses, yellow buttercups and white snowdrops. Come on, spring!! You look absolutley adorable in that dress! one going myself so keep it up! 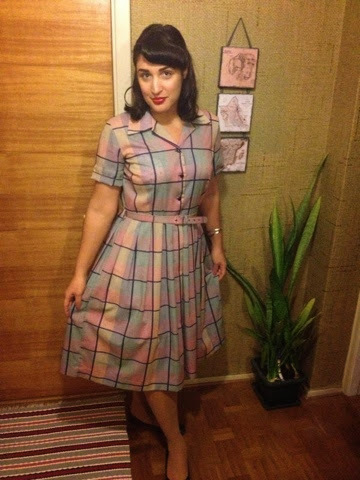 I love the idea for this blog, and I love vintage and I love to hear about your life in Sweden! :) That dress suits you perfectly, and I too am such a sucker for plaid! Major score on the lamp too. :) I didn't know your family is from Kapa`a--my grandma's side are from Wailua so they all went to Kapa`a high school. Can I ask what your family's name is? I recently started working at Muumuu Heaven in Kailua, have you ever been there? Oh, this is Peanut, btw. :) Sorry..
Hi Peanut! With a name like pineki I knew it had to be you. Thank you so much for checking out my blog! We are from Kapa`a! Well, the Portuguese side is at least. We are Victorinos! :-) The old-timer potagees of Kapa`a will surely know that name, haha. My family has a house right across the street from Kapa`a High School, where my great-grandpa was the vice principal and my great-grandma was a school teacher. My Hawaiian side is from Kukuihaele + other East Hawai'i towns. Cool to hear that you're working at Muumuu Heaven! I've been there before. Beautiful fabrics! Do you have to speak Japanese to work there? Just wondering, since I hear they're quite popular with tourists.